What Do I Do If I Was Hurt on the Job in Iowa? What Should You Do When Injured at Work? In Iowa, you technically have up to 90 days from when you knew or should have known that your condition was work related to report an injury to your employer. However, sometimes waiting can create a lot of problems, so the best advice is to report your injury right away. This often will include filling out an accident report form. If your supervisor pressures you to not report an injury you sustained on the job, you should consider talking to another supervisor or the human resources department. Failing to timely report a work injury can make it much more difficult to win your case later on. What If I Didn't Realize the Injury Was Work Related? Sometimes injured employees will not realize that a condition is work related until they see a doctor. This happens frequently and if it happens to you then you should talk to your doctor about your medical problems and what you do at work. It is helpful to have a copy of your job description to provide to your doctor. Based upon the information you provide, your doctor may be able to say that your medical condition is work related even though you have not yet reported the work injury. What If My Condition Happened Over Time? It is fairly common for an injured worker with what we call a cumulative trauma injury to not report a work injury the first time they feel pain. Cumulative trauma means that an injury occurs over a period of hours, days or weeks. If you sustain a cumulative trauma injury because of your work activities, then under Iowa workers' compensation law you have a compensable injury, meaning an injury that your employer and/or their insurance company should be responsible for. What Should I Do If My Doctor Says My Injury Is Work Related? If your doctor says that your medical condition is likely work related, you should notify your employer and provide a copy of the doctor's records stating this. At that point, it is likely that your employer will investigate your work injury and may send you to their doctor for an evaluation and to determine if your condition is work related. If at any point during the process you are confused or have questions, then you should consult with an experienced and qualified Iowa workers' compensation attorney. 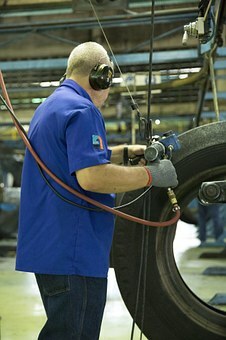 We offer injured workers in Iowa a work injury evaluation at no cost or risk. Also, if your claim has been denied, you should at least consult an attorney about the facts in your case instead of just giving up and trusting the insurance company's denial. For Immediate Assistance or to schedule your NO COST work injury case evaluation, CALL 641-792-3595 and ask to speak with Corey or Erik, or contact us online. 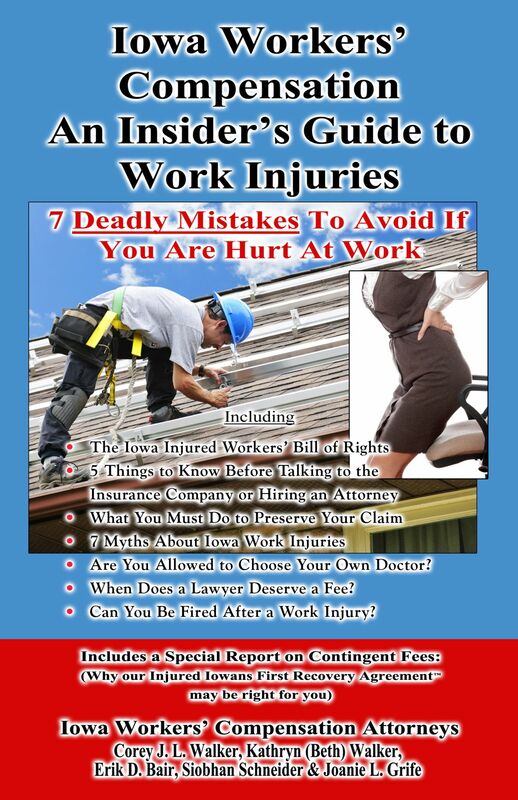 To receive a free book entitled "Iowa Workers' Compensation - An Insider's Guide to Work Injuries" which describes Iowa work injuries, including the "7 Mistakes To Avoid If You Are Hurt At Work" Call Now 1-800-707-2552 (ext. 511) (24-hour recorded message) or log on to www.IowaWorkInjury.com. Why offer a Book at No Cost? Iowa Workers' Compensation Attorney Corey J. L. Walker practices primarily in workers' compensation law and has represented hundreds of Iowans hurt at work and has seen too many clients from Des Moines, Newton, Cedar Rapids and throughout the state of Iowa make mistakes before they had the “right” information about work injuries, resulting in them losing thousands of dollars. Iowans hurt on the job are beginning to realize that the insurance company is not there to help them and that they should have someone on their side.